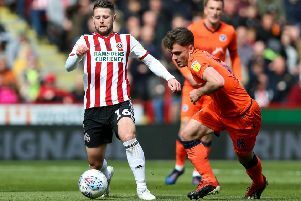 Sheffield United boss Chris Wilder praised a scintillating performance from his team as they brushed Bolton aside 3-0 at the University of Bolton Stadium. The Blades scored twice in the first 22 minutes through Mark Duffy and Kieron Freeman before John Fleck added a third with 17 minutes remaining. Wilder said: "We are moving forward nicely. We know what to expect when we come here and it was really important we started off on the front foot and got the first goal. "We should have got the first goal after two minutes, we should have got a third after three minutes. For us to get that goal then double it up really gave them a big problem and it was a good afternoon for us. "I thought there were some really good performances but the attitude of the team was excellent. We turned up and got our rewards." Bolton stay third after this defeat but the closest they came to scoring was a shot from David Wheater which was cleared off the line shortly before half-time. Boss Phil Parkinson was disappointed with the result but said it shouldn't detract from the way his team have started the season. He said: "We started slowly and we got punished for that. We have been gritty and resilient at the start of the season but we were really loose in that first 20 minutes and got punished for it. "All the basic things that we have been doing so well to make sure we stayed in games we didn't do and that gave a good Sheffield United team a lift. "Some of the play was good but the players didn't stick to their roles and responsibilities as they have done so far this season. It's a good lesson for us because we got punished. "The lads have been terrific so far this season to give us 10 points from five games. We're not going to get too down. We're disappointed but we'll regroup on Monday morning."